With a correlated colour temperature (CCT) of 6500 K, D65 corresponds to "average daylight from the northern sky" and is the reference illuminant in DIN 6173-2 "Colour matching" and a referenced illuminant in ASTM D1729. Its spectral energy distribution between 300 and 780 nm is described in DIN 5033 at increments of 5 nm. Any lamp designed to simulate D65 must comply with standard ISO 3668 "Visual comparison of the colour of paints". The standard describes all the parameters required to ensure standard-compliant colour comparisons, such as standards presentation, viewing and ambient conditions. The illuminance level defined in this standard is between 1000 and 4000 lux, this wide range being due to the diversity of different applications. JUST viewing booths and luminaires achieve an illuminance of 2000 lux as standard, with optional brightness controls on soft proofing models. 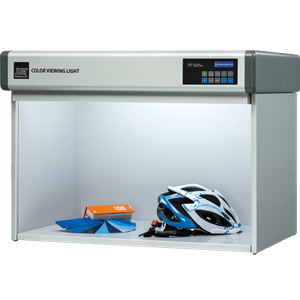 In addition to the spectral simulation of daylight, a D65 standardised light must contain the UV component of the standard illuminant to support detecting optical brightening agents (OBAs) and other fluorescing materials. 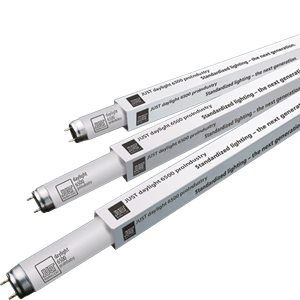 ISO 23603 defines the required simulation quality for standardised lights in the visible light range (VIS) and in the UV range. Colour matching standards, such as ISO 3668 and ASTM 1729, stipulate that a D65 simulator must correspond to quality grade BC in ISO 23603 as a minimum. 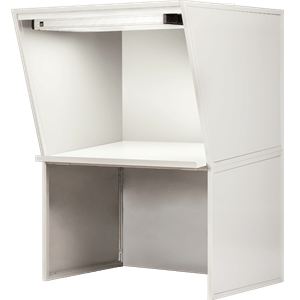 All JUST standardised viewing booths and the JUST daylight 6500 proIndustry lamps exceed the stringent requirements of the colour matching standards, readily achieving tight tolerance limits. With a homogeneous, faithful simulation of the CIE-D65 spectral energy distribution, a high colour rendering index, and good metameric properties, these products create controlled, reproducible lighting conditions for standard-compliant colour assessment and matching across a very wide range of materials and industries.